aaaaahhhh, I feel much better today! I have been experimenting with chocolate & ice cream in my coffee & it is so yum!! I think it has calmed my restless soul. It is calm & quiet in my house today, thank GOD!! 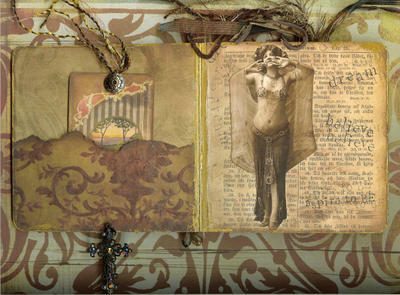 I even had a chance to work in my art journal, now that is a miracle! So ....if I rant & rave into cyberspace I get my way? Like I did yesterday. If I wished for 50 million dollars would I receive my wish?! :) ya know, just a million wouldn't do! So... today I think I will take the kids downtown to the strip, we have been wanting to go exploring. The Tropicana has a new display, tons of artifacts from the Titanic, I think they even mention you can walk into the original hull of the ship, sounds very interesting. Also want to go check out some bustiers at the Venetien. Have been thinking about making them again with my sister. We used to be quite famous in Seattle for making them...many moons ago. I am rambling, so my que to get to work. But not before I say a thanks to some readers that left some sweet comments! I can't believe I have had over 100 readers already! I am so addicted to reading blogs....I love it! Such a great picture! Can't believe you made it. I hope you display more pages from your altered books! Starbucks has that kind of coffee... no need to experiment.